Morocco was an absolutely eye opening and life changing experience for me. Ever since my elder sister did a volunteering programme in Fiji with Projects Abroad, I had always wanted to follow in her footsteps. But I wanted to choose something more personal to me. When I was researching, I had a choice between three different countries for my Care & Community programme with Projects Abroad; Morocco, Fiji, and Peru. I chose Morocco mostly because I really wanted to learn more about the culture and their daily routines. Morocco is also a French-speaking country and I wanted to practise my GCSE French (which definitely came in handy during my trip). I also made a documentary about the whole experience, which I’ve shared with Projects Abroad. 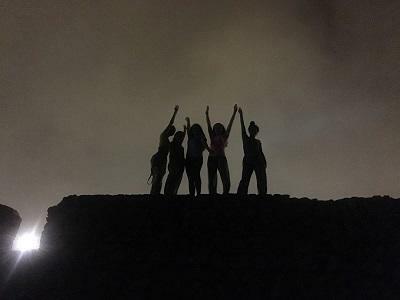 It was a good way to capture moments and show other people exactly the kind of things we volunteers did. We worked in a day care centre for street children for two weeks. Our main role was to interact with the children, play games with them, chat, and teach them English. Our work was very flexible and we could tailor it according to the types of activities we knew best. All the volunteers agreed that you really had to be there to see how happy you make these kids by just being with them. There were so many beautiful moments I experienced, and it really did make me grow as a person. One of my favourite moments was with one boy in particular. We were all colouring on a table and he didn’t want to. He refused to draw and refused to even have a paper near him or help me colour my picture. So I decided to play a game of noughts and crosses with him, and it got him rather excited. This was all communicated through gesture, as I couldn’t understand Arabic and he couldn’t understand English or French. I then decided to teach him a new game similar to noughts and crosses, but with lines and dots. It took a few tries but eventually, with a point system, tons of examples, and celebration, I was able to teach him how to play it. I found it so magical how without any language, I was able to teach this child a new game which made him happy and enthusiastic. It was so heart-warming. We definitely got the full Moroccan experience living inside the ‘medina’ (old city) with our host families. Indeed, we were immersed in their culture, as we slept with blankets like they did and we ate from one central plate like they did. Alongside working at the day care centre, Projects Abroad also organises other evening activities throughout your stay. 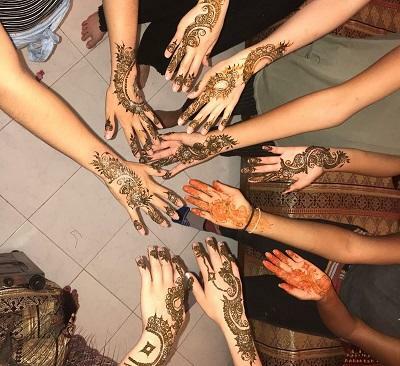 We had a cookery afternoon, a pottery class, ice cream and coffee gatherings, cultural discussions and, my favourite, the Henna night. 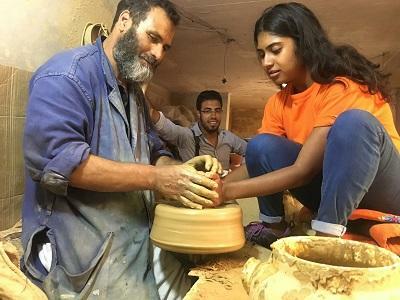 These activities really help you get a fuller, truer Moroccan experience. Not only that, but they also give you the chance to interact with other volunteers and get to know them. I promise you, by the time you leave, you will have made lifelong friends and you will have shared amazing memories with these people. 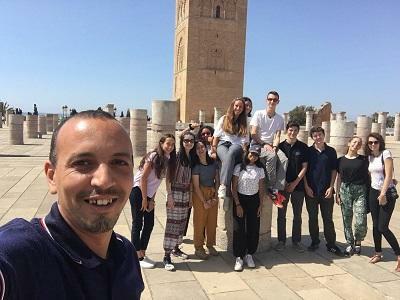 During the weekend, our High School Special group went to Chefchaouen, a blue city in the North. We stayed in a hotel, shopped, and went sight-seeing. It was truly memorable. The main challenge was, undoubtedly, the language barrier with my host family and at my placement. We did have our instructors to help us translate and some of us spoke French, but it was still quite a difficult barrier to surpass. I was lucky that my roommate spoke Arabic and so she was able to tell my host mum how much I loved her food! I learnt to be happy. Being exposed to these children who have so many difficulties and seeing them smile and laugh made me think that we are losing time being sad. It was so eye opening to see how excited they were by things such as crayons, which to me used to be so ordinary. I realised that sometimes between schoolwork and our fast-paced lives, we forget to appreciate the little things in life. Going to Morocco and being with the children also helped me discover my newfound passion for colouring! It was really heart-breaking to say goodbye to the children at the placement and the other volunteers. I was on the same connecting flight with four other volunteers and it was delayed, so we all lost our connecting flights. We all had to stay in Paris for a night, but it was a lovely experience because I was with my close friends and we made amazing memories. I will certainly never forget this experience.